When one of the world’s foremost exercise physiologists was diagnosed with diabetes, it caught his attention. Dr. Tim Noakes at the University of Cape Town, South Africa, is arguably the most famous writer and researcher in running sports. He’s also an accomplished ultramarathon runner. For decades, he had advocated the conventional low fat, high carb diet for athletes, plus techniques like carbohydrate loading before big efforts. When he was diagnosed with diabetes, he had to consider that maybe something was wrong with his approach. 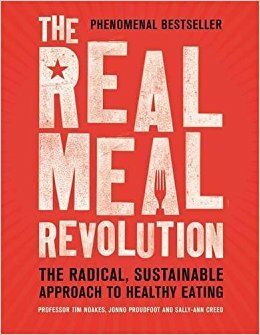 That resulted in a book, The Real Meal Revolution, co-authored with chef Jonno Proudfoot, and nutritionist Sally Ann Creed. Thousands of people in South Africa have used the book to change their lives. Tim and his collaborators have crafted a formal program to help people learn healthy nutrition. Here are some of my impressions of the book, plus some recipe assessments by my friend Donna. One striking aspect of the diet/program is that they refer to it as “Banting”, homage to the Letter on Corpulence pamphlet published by William Banting in the 19th Century. I was already aware of Tim Noakes’ work and have corresponded with him. 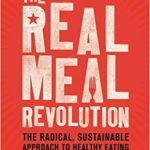 I purchased The Real Meal Revolution as soon as it was available in the United States. It has a format that’s somewhat different than the other similar books. Other authors have a detailed discussion of their interpretation of the science, then some practical information. This book goes through some basic ideas, presents the principles of the diet, then most of the rest of the book are recipes. Tim has a detailed discussion of the science at the end for those who want to dig in. I found the basic ideas and plan consistent with my own assessments. They were clear and easy to understand. Tim’s discussion helped me understand where the insulin/fat hypothesis arose in the early part of the 20th Century, before it was ignored by the low fat diet zealots. There were a couple of areas of factual misstatement, although those didn’t detract from the basic ideas. Several were in my area of expertise, evolutionary biology, that I won’t go into here. The most glaring recent history misstatements confused the changes in the composition of commodity crops in the 1970s due to conventional agronomy techniques, with the Genetically Modified Organisms (GMOs) which occurred in the past 20 years or so. The book is worth reading, and a perfectly good starting point for understanding healthy nutrition. Big prep recipes are best left to days off work, stay at home parents, or for company. I like the recipes and instructions, but this is more of a “have fun with” book, the recipe section. Most people want quick and healthy. It may make some not even want to try high fat, no carb lifestyle. If you’ve been a person who has cooked your whole life, you will probably enjoy trying the recipes. Some of the recipes don’t give servings? Creme fraiche? English mustard? Lot of terms that I, as an American, don’t know without looking up what they are. Like the one pan recipes. Eggs would go great with the hordeve type dishes. Coconut Hotcakes and Strawberry Compote. Smoothies are easy and usually a hit. Salads are always fun and can be a meal in themselves. Bacon-fat Cherry Tomatoes with Bocconcini. Yum, yum, easy enough, be great with eggs over easy. Nutty crackers do not have eye appeal. They may be tasty, but you have to want to them and they don’t get taste buds excited by looking at them. Carb-free Pasta, Crepes, Tortillas– too much work for busy people, but OK if you like to cook. I guess if you want to play with recipes, fermented pickles may be fun. Lime and Sumac Rump Skewers– sounds good, but what is sumac and where would you get it? Smoked Mackerel with avocado and lemon– smoked mackerel, maybe hard to find? Replace with other types of fish? Kale with Chorizo and Eggs– looks really good, have to be in a prep and cook mood. Eggs Baconnaise– What’s aubergines? I assume bacon is rashers? Too much time and work for regular people, unless to impress. Benchmark Omelette– like the humor in directions, easy and quick enough.